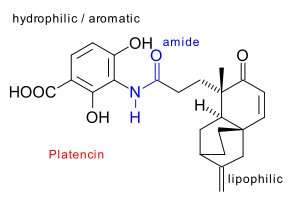 A close cousin of Platensimycin (See here) is called platencin : a metabolite of a similar strain of microbe (discovered in a soil sample collected in Mallorca), structurally similar, first reported by Merck (Wang et al. 2007 > 20 authors! DOI Jayasuriya et al. 2007 DOI) and its first total synthesis reported by the Nicolaou troupe (2008 DOI). Highlights in this synthesis (focusing on the tetracyclic core) are a salen ligand based asymmetric Diels-Alder reaction with a Danishefskys diene analoque, a gold catalysed silyl enol ether / alkyne cyclization, a Barton-McCombie deoxygenation accompanied by a radical rearrangement reaction and a Wacker oxidation. In the space of three months Hayashida & Rawal signed on for (racemic) synthesis number 2 (2008 DOI) followed by that of Yun et al. (2008 DOI) and Tiefenbacher (2008 DOI). 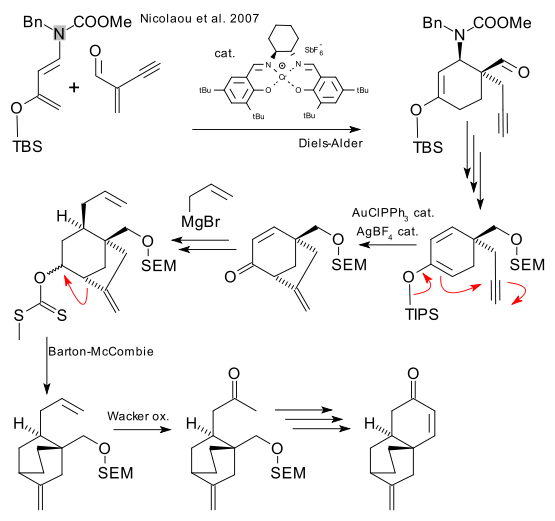 The Hayashida/Rawal method also hinges around a Diels-Alder reaction (the diene is a Rawal invention) that is followed by a Grieco elimination, a DIBAL reduction, a Nicod couping reaction and a ketone deoxygenation (through a hydrazone). Tiefenbacher also uses the Rawal diene with - cleverly - common and chiral food-additive perillaldehyde. 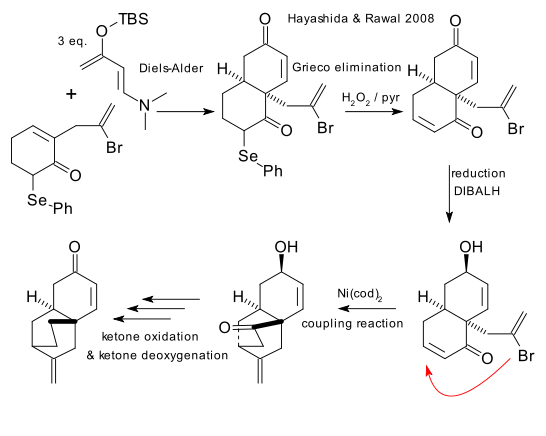 The remainder of the reaction sequence (a days work) consists of Wittig reaction converting the aldehyde to the alkene, a metathesis reaction, a NBS bromination and a reduction (chromium chloride / lithium aluminumhydride). Please stand by for platencin synthesis 5 through 11 to published by a publishing house near you in the near future unless of course the Merck people discover their third bacteria strain.